Outdoor advertising works well for promoting your product in specific geographic areas. 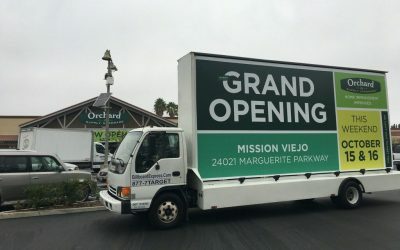 While billboards, bus benches, and transit advertising can be very effective for the small-business owner, any successful outdoor campaign begins with your own location’s signage. Your outdoor sign is often the first thing a potential customer sees. Your sign should be sufficiently bright and conspicuous to attract attention (without being garish) and sufficiently informative to let prospective customers know what’s sold there. Ride around town and observe which signs catch your eye. Note which ones don’t. Then think of the impression each sign gives you. Remember that you never get a second chance to make a first impression, so give this important marketing tool your best efforts. If you’re involved in a business that has a fleet of vehicles conducting deliveries or providing a service, your company’s name, logo, and phone number should be clearly visible on the vehicles. It’s free advertising that allows you to increase your exposure in your market. Billboards are most effective when located close to the business advertised. Because of their high cost, they’re usually used to reach a very large audience, as in political campaigns. They’re likely to be too expensive for most small firms, and some communities have strict ordinances governing the placement of billboards. In Vermont, for example, they’re prohibited. Bus-bench advertising is an excellent medium because it’s highly visible, like a billboard. Essentially, bus-bench advertisers have a huge audience, held captive at red lights or in slow-moving traffic. An account executive of a Los Angeles-based bus bench manufacturing company said that an advertisement on one bus bench at a busy Los Angeles intersection would be seen by 35,000 to 50,000 people per day. Usually, the advertising consists of simple two-color artwork with your company’s name, brief copy describing the product or service, address and phone number. Rates and terms vary depending on the city you’re in. Call your city’s mass transit department or local bus company to find out who rents advertising space on their bus-stop benches. Some outdoor advertising companies also handle this type of advertising. Transit advertising on buses and taxicabs reaches lots of people, especially commuters. Your ad is highly visible, and market research on transit advertising shows that it’s very effective.